Vestil FM-2072 Mechanical Edge Of Dock Leveler is an economical loading dock solution designed to save floor space and increase safety by eliminating pinched fingers and toes. 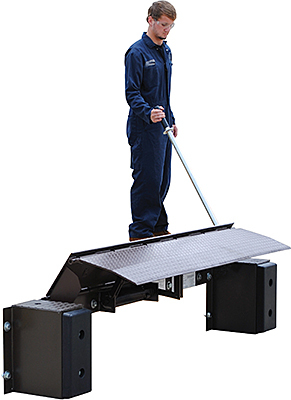 Edge-o-dock leveler features a 20,000 LB capacity, 72" usable width, 5" above and below deck service range, a standard ramping length of 27", toe guards, and zerk fittings. Two 18”W x 8”H x 2”D rubber bumpers are included. The Vestil FM-2072 permanently attaches to the dock face. A concrete recess is not required. 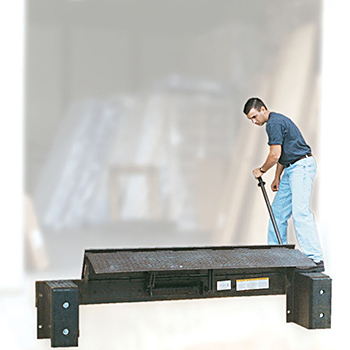 Dock Leveler is constructed of all steel for years of low maintenance service. 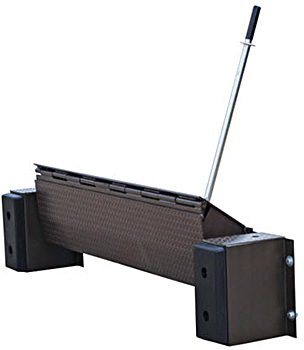 This Vestil Edge Of Dock Leveler is operated by placing the handle into the inner lip pocket and pulling downward. The handle is then pushed forward extending the lip until it rests on the trailer bed. Upon trailer departure, the lip automatically retracts behind the face of the bumpers. A steel curb edge, approach plate, or approach ramp is required for proper weld on installation. See options below. Standard ramping length is 27" (36" length also available - contact us for information).